Purchased this item for my guest bedroom, item looks exactly as pictured, color we purchased was exactly as the picture, order came fast without any issues. would buy it again. Sleep without any cleaning hassles with this oversize coverlet set. The advanced quilting prevents the filling from shifting, ensuring a lasting soft, lofty feel. The microfiber fabric is hypoallergenic and luxuriously soft. Love the color and it hangs couple of inches from the floor, which is what I wanted and is hard to find. Spread is thinner than I thought it would be and quality of materials is pretty average. Works well enough. I was looking for a long & wide cover for my king sized bed, so that we could get rid of the bed skirt, which was a total pain to keep in place. This bedspread fits the bill. It's actually a little long, unless you want to do the classic bedspread thing, covering the pillows & tucking underneath them. The navy color was indeed navy. As a previous reviewer mentioned, what looks like sewn-in quilting is actually little glue lines. Because of that, I'm not expecting this to wash well, but I haven't tried it yet. One note - the description said "microfiber," but this certainly is not the soft fabric that I expect when I think of microfiber. This is more like a thin khaki-type material. It has the navy color & plastic quilted pattern on both sides, so it's not horribly thin, though. Except for saying it was microfiber, this matches the description reasonably well. That's why I'm giving it 4 stars. I ordered this because of the size....regular king sizes very seldom fit a king bed!! It is perfect...and I love the color. I ordered grey but it is more like a taupe....very, very nice!!! I purchased this coverlet after researching many others on other sites and in stores that were much more expensive. The color is true to the picture and the size is perfect. It covers both sides of the bed down past the box spring and I generally fold it over a little at the top to keep it from dragging on the floor. It is a great value for the price! I ordered the plum for a room the needed brightening up. Did the trick! The thermal pressing has a nice look and the weight is good for summer, just what I was looking for. It is soft and comfortable to sleep under. The coverlet is huge, which allows me to tuck in the edges on a platform bed, so anyone with a standard boxspring and mattress would be pleased by the size. I have yet to wash it and hope it will wash well. I would prefer a light quilting as opposed to the thermal press look, which is why I gave it four instead of five stars. Love the color and weight of this coverlet. We were looking for a bed cover to use instead of a comforter that was too warm for Spring and Summer weather. This Comfy Bedding coverlet is the perfect solution! It is lightweight yet warm enough to keep us cozy and comfy. It has a velvety soft feel with a crisp, clean finish that makes the bed look great and neatly dressed. We'll use it all year round. I found great use out of the product as it was inteded. I gave it as many stars as I did because I found no issue with the product. If it doesn't work as expected I will look for a refund. There are no issues at this time though. I feel it is made of quality materials as I don't see any imperfections at this time. IF there are any that arise, I will rereview this product. I hope this helps someone in their purchasing decisions. If the product is damaged or ends up not working as expected, Overstock has an excellent return policy. I am very pleased with this oversized coverlet. I have been trying for years to find a bedspread or coverlet that will cover my mattress. Using a dust ruffle (which isn't my style) does not do the trick. The style. of this coverlet is contemporary. This is a beautiful over sized coverlet! I was looking for a oversized coverlet for my king size bed so I could tuck it under the mattress for a modern look on my platform bed. This coverlet definitely fits the bill! After only a week of use, the thermal pressing released and we now have several patches on the bedspread that have no design (which was one of the main reasons we purchased). It's usable and didn't fall apart, but it's not a show item if you're interested in creating a clean, crisp look for your bed or bedroom. Great quilt and perfect size. Oversized as described!! We had trouble finding a quilt that would come down far enough on both sides of the mattress and this one does the job!! Finally a cover that covers everything. This cover is large enough to cover our pillowtop king and hang down like a cover should. It is very thin so it will work in all seasons. Ordered he black and it's a rich black even after the first washing. Ordered queen for my bed and it was a little too oversized. Took to my seamstress for some alterations and now it's perfect. Does kind of look like a moving blanket as someone else stated but I'm still happy with my purchase. I ordered a full /queen brick in this coverlet. Loved the color but a full /queen fit like a king and the tag said bedspread. Needless to say I returned this item! Such a good purchase! I love this comforter. It’s thick enough to keep us warm in our basement apartment but thin enough that it’s easy to clean. Would definitely buy again! I love the oversized spread. I don’t like using skirts, so this does the job I need. The light khaki color matches my colors in my bedroom perfectly. The coverlets are perfect for me since I prefer lightweight cover rather than heavy comforters. Keeps me warm but not hot. Colors is very soothing. I bought this beautiful set in black and it has exceeded all of my exhortations- very well crafted and beautiful material. Fits bed perfect with a very thick topper on it. 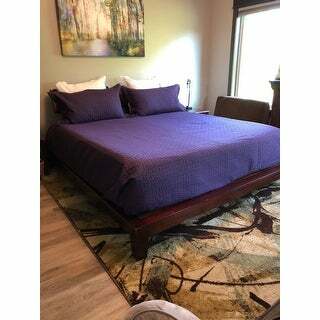 Super nice light weight coverlet set. Enough weight to keep you nice and comfortable but doesn't weigh you down in the bed. Great shipping as always from Overstock. Thanks for all the great products we've gotten so far. The quality is as expected and very nice. It has a good weight for being in the thin side. I pitched for my mother and she absolutely loves this as well as the abbey we purchased. Very nice and would recommend. "what does "advanced quilting" mean? Is it stitched wth thread?" no. it is glued in a stitching pattern. I've been using this spread for over a month and so fat the stitching is holding, even with pets on the bed. I haven't washed it yet though. That will be the true test. Looks great, love the color, will be great for summer weather. "What about the lamp and shade? Where can you buy matching lamp and shade to match the bedding? " The lamp is for display purposes only. "Not sure what color the grey is. Looks very brown on the website. Taupe is okay but not brown." It is closer to a dark brown color.